5 ways small vending machines can bring in big profits. Small vending machines can make big money! When people think of vending machines, they often think of large, hulking machines that hold dozens of snacks and take up lots of space. However, many vending machine operators have discovered that smaller, wall mounted snack machines can offer a great way to improve your bottom line. Here are 5 ways considering small vending machines may be useful to your business. 1) Small vending machines, big choices! Small machines aren’t just for snacks and candy. Smaller vending machines offer the opportunity to sell beverages, snacks, prepared food choices, and more. 2) Up to date payment options. Smaller vending machines don’t have to stick with coin-operated payment options. They can now also take bills, and even credit cards, giving your customers more flexibility. Some businesses are hesitant to host a vending machine because of concerns about energy consumption. Small vending machines, however, are more energy efficient and tend to be more attractive to retail centers. Another issue which may cause businesses to be hesitant to host your machines is the square footage they take up. Mini vending machine options and wall mounted machines in particular, eliminate this issue. While smaller machine brings to mind gumball and candy machines, today’s small and even mini vending machines are incredibly flexible. They can sell everything from cheap vending machine fare, such as typical snacks and candies, to full-service options that can make espresso, or serve up prepared foods and drinks. There are even machines that serve soft ice cream options. The fact is that a business based on bulk mini vending machines can make as much, or even more than larger, bulkier machines, and their small size and flexibility in food offerings mean great opportunities to make money in almost any setting! 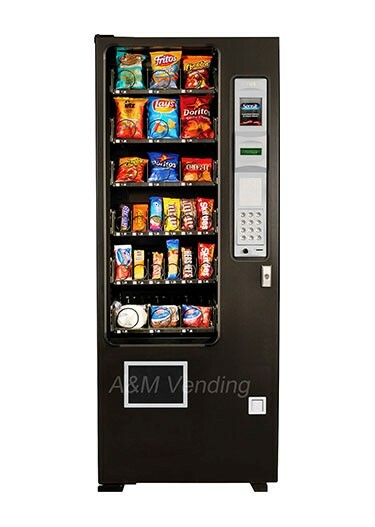 One of our favorite small vending machines is the AMS Slim Gem Snack Machine. With 24 selections available and weighing only about 500 pounds, it is a great choice for small spaces or to start your blossoming enterprise! This entry was posted in Start A Vending Business. Bookmark the permalink. Vending Machine License: Is It Something You Need? Do I really need a website for my vending machine business?